Everyone's needs are different that's why a Restore 2 New gift certificates is the perfect solution when you know that you want to give the gift of health, but just can't seem to figure out what they'll like best. 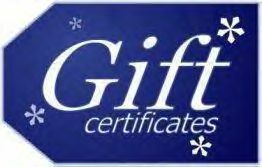 Gift certificates for our natural health supplements or skin care products make great gifts. They can be purchased any time of year in amounts ranging from $15 to $250 and are valid for one year. Gift certificates also can be accompanied by our other products too! Show Someone How Much You Care with a Gift of Health! If ordering by phone, we will need your credit card number, expiration date and recipient's information. We can E-mail or mail the Gift Certificate to you or to the recipient. *This is the e-mail address to which we'll send the e-gift certificate. It must be a real e-mail address or your gift certificate will not reach its destination. You can also e-mail or call us with any special instructions. It is easy to redeem by placing a phone order and providing the Gift Certificate Serial Number, and the "From and To information". This can also be redeemed via a mail order or online. Add the appropriate products to your cart and checkout normally. When you arrive at the "Order Confirmation/Payment" screen, enter your Gift Certificate code into the box labeled "Coupon Code". Please note: the Gift Certificate code is "cAsE sEnSiTiVe". The code must be entered exactly as printed on your certificate, with lower and upper case letters preserved. Press "Continue". The discount should now be reflected in your shopping cart. Select your Payment Method and press "Submit Transaction". If the Gift Certificate is sufficient to cover the entire order including shipping, you will not need to enter any further payment information. Simply press "Continue" to complete your order. Otherwise, you will be asked to enter your credit card number and expiration date. If a problem arises and your Gift Certificate code doesn't work, please email us at: contact us or you can continue with the checkout as normal. If you proceed to checkout, enter the Gift Certificate code into the "Order Comments" field. Your Gift Certificate will be applied when we process your order. You will not be charged for your order if the Gift Certificate is sufficient to cover your entire order including shipping. If your order exceeds the value of the Gift Certificate, your credit card will not be charged until after the Gift Certificate has been applied to the total order. Gift certificates and unused portions of gift certificates expire one year from the date of issuance. Any unused balance will be placed in the recipient's gift certificate account and is not transferable. The original expiration date will apply to any unused balance. If you or the gift certificate recipient loses a gift certificate code, you will be asked to provide proof of identity before the gift certificate code can be retrieved. If you lose a gift certificate code or have other questions, please contact customer service at: 541-928-6423 or email us at: contact us.